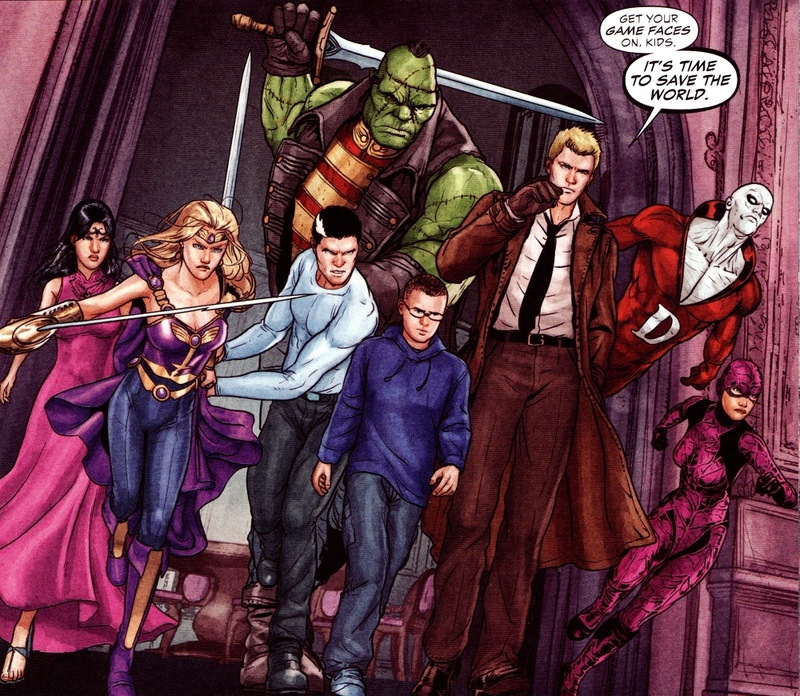 Dominating my pile of comics over the last year, Justice League Dark (JLD) has been the must-buy book every month. 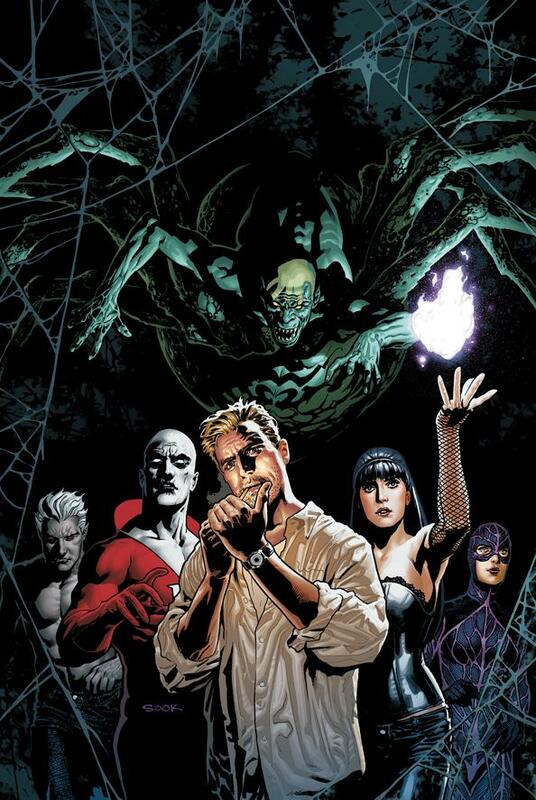 Justice League Dark Volume 1 collects issues 1–6: readers are introduced the characters, watch the team form, and see them defeat their first enemy. Surpassing some of DC’s other team titles, I first felt the effects of JLD when I saw an image of its first cover in a New 52 preview book. I even snagged extra copies of the preview so I could have multiple copies of the image. When the premier issue debuted in September 2011, I was hooked. Of DC’s New 52 reboot, some of the rewritten characters and histories have changed for the worse, but JLD packs punches with pinpoint precision. I read the first issue three times in a row, and then once more just to better absorb the art. The story starts off with the supernatural misfits of the DC universe being summoned together by Madam Xanadu, an immortal seer who also appears in another “DC: The Dark” title, Demon Knights. 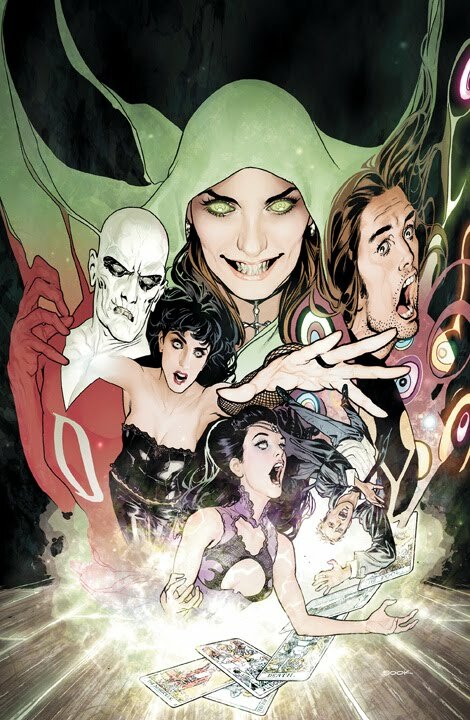 Madame Xanadu gathers together Vertigo alumnus John Constantine with some mainstream DC heroes like Deadman and Zatanna to take on wicked witch the Enchantress. Previously two entities fused into one, the Enchantress and her alter ego June Moone were split into two separate characters in the Flashpoint event, with the Enchantress subsequently going insane. The Enchantress half wants June Moone back, but June, who usually tempers the Enchantress’s evil, is less than thrilled at the idea. The Enchantress packs one hell of a magical smash as she tears apart the DCU, creating everything from wild storms made of teeth to eternal darkness over city landscapes. When I first heard about the proposed storyline, I thought writer Peter Milligan might be borrowing ideas from Marvel’s House of M, which features another famous witch going out of her mind. Instead, the creators take a refreshing and original approach in both story arc and team assembly. Deadman remains one of the coolest heroes in comics and this title continues to showcase it (see my previous review of DC Universe Presents Volume 1: Deadman & Challengers of the Unknown). Zatanna, fresh from her “never should have been cancelled book,” remains in an appealing spotlight. I was glad to see that she did not go the way of Donna Troy and get left out of the re-launch. The most familiar con man in comics, John Constantine enters as an unwilling leader to the group, which seems both calculated and overly emphasized, but still fun to watch on the page. Shade the Changing Man joins the team as an original member, but also one of the first to leave as the story progresses. The book is gothic and weird, both inside and out. The collected volume looks like a cross between an old grimoire and a vinyl Def Leppard album. Mikel Janin’s layered art fits the dark tone of the series, but suffers from a familiar problem of drawing all the women with the same face; however, gorgeous angles and layouts make up for it, as does the stylish, updated clothing in which he drapes the characters. My only complaint is that the team roster changes a bit too often for my taste. Deadman, Constantine, and Zatanna are the only regulars, with Madame Xanadu taking a more passive role at different times. Still, there is a certain method to it, as it allows the book to be a sort of meet-and-greet for all the offbeat supernatural characters in the DCU. Appearances by Swamp Thing, Frankenstein: Agent of S.H.A.D.E., the bloodsuckers from I, Vampire, and even Amethyst, Princess of Gemworld are all welcome guest stars who, for the most part, make good use of their appearances. I also felt some of the characters weren’t being presented in their full potential. It seems like Madame Xanadu, an ultra-beautiful immortal who can see into the future, should lead the team, but it quickly becomes clear that Constantine is really leading everyone through manipulation. And with a character as powerful as Zatanna, I was disappointed that her skills seemed less intense than previous titles indicate she’s capable of. Possessing more of a moral compass then Constantine, it might have been fun to see her take the leadership role at some point as well. There is some redemption for her in later issues, though, especially after magic conduit Timothy Hunter turns up. This first volume has many great moments that include personal struggles for each member, as the dynamics of teamwork mean something a little different to each of them. Highlights include Deadman’s relationship drama with Dove (of Hawk & Dove) and a disturbing look at what Shade the Changing Man’s idea of a girlfriend entails (he can create and destroy her at will with his reality-warping jacket). There’s also the mystery behind Madame Xanadu’s motives, as well as seeing how John Constantine is going to “talk himself out this one” (again and again). This series doesn’t get as much press as it should, but it’s enough of a cult favorite that there are rumors director Guillermo del Toro, no stranger to dark comic books, as his vision of Hellboy will attest, may be bringing his own brand of movie magic to JLD with a silver screen adaption. Everyone knows Superman and Batman (who make brief appearances in the first issue), but if you want to be introduced to some less familiar characters with a darker twist, look no further than Justice League Dark Vol. 1. Follow some of DC’s most eccentric characters as they weave true magic on the page by blending urban fantasy, high adventure, and a core team roster that conjures an experience readers won’t want to miss. Recommended? Utterly and completely. This is the book to run back into the burning building for.